Devlin, Wonderlich, Walsh, Mitchell, Foreword. Part I: The Search For Causes. White, Gianini, Bed and Obesity. Franko, Lovering, Thompson Brenner, Ethnicity. Bulik, Trace, Genetics. Goldschmidt, Boutelle (With Knatz, Madowitz), Tanofsky-Kraff, Children and Adolescents: Loss of Control Eating Risk Factors, Correlates, Outcome and Assessment. Karr, Simonich, Wonderlich, Binge Eating Disorder, Childhood Trauma, and Psychiatric Comorbidity. Mond, Hay, Comorbidity and Related Considerations. Hilbert, Hartmann, Body Image (Disturbance). Arnold, Empower the Patient With Science. Part II: The Search For Solutions. Banker, Introduction: Closing the Research-Clinical Gap. Berg, Peterson, Assessment. 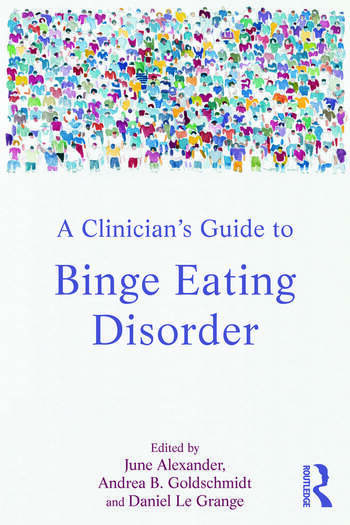 Segal, Altman, Weissman, Safer; Chen, Dialectical Behavior Therapy for Binge-Eating Disorder. Wilfley, Mcclendon-Iacovino, Gredysa, Psychological Interventions (Cbt, Ipt). Crow, Psychopharmacologic Interventions. Osborn, Miller, Vannucci, Goldschmidt, Boutelle (With Knatz and Madowitz), Tanofsky-Kraff, Children and Adolescents: Loss of Control Eating Interventions. Engel, Mitchell, Bariatric Surgery. Accurso, Sánchez-Johnsen, Behavioural Weight Loss. Pershing, The Clinician’s Toolbox. Field, Sonneville, Prevention. Turner (Beda), Assisting the Translation from Research to Practice – Two Perspectives: Part One. Grefe (Neda), Assisting the Translation from Research to Practice – Two Perspectives: Part Two. Devlin, Wonderlich, Walsh, Mitchell, Afterword. Andrea B. Goldschmidt is Assistant Professor on the Eating Disorders Program at the University of Chicago.